Grumpy Grandad is very proud of his fish pond in the garden. Yet every time he looks to admire it, he notices that the water level seems to be dropping. What Grumpy Grandad doesn't know is that Maurice the mole has been digging nearby and that chaos is about to happen! Children love spending time at their grandparent’s house, often because grandparents have more time on their hands to have fun. This Grumpy Grandad series of fun audiobooks created by Ann Twigg help children learn by using their imagination and encourage laughter and fun and was inspired by a series of events that happened when a naughty mole decided to dig in Ann’s garden one summer. Ann wrote these brilliantly funny stories to entertain her grandchildren and the children in her class at school. Children are very inquisitive about animals and particularly animals that can’t be seen. Maurice the mole is brought to life in this fantastic kid’s story that is funny and educational and will have your child laughing out loud. This is a lighthearted audiobook that has been proven to captivate children. Ann used to hold the attention of young children with this story at the school where she worked for many years. 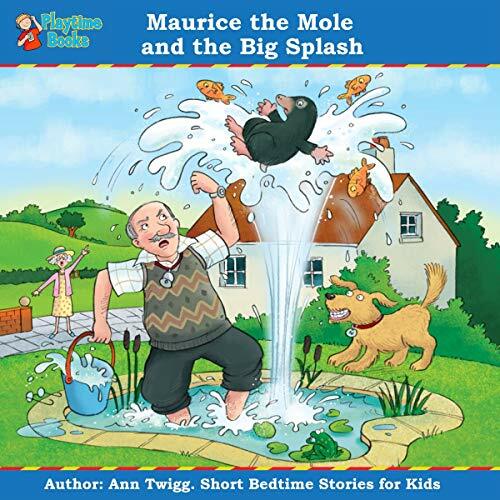 This is the third audiobook in the Grumpy Grandad series of audiobooks, and Ann tells the story of when Maurice the mole decides to dig a hole in the fish pond. This audiobook story will have your child laughing out loud while listening. Scroll up to add this audiobook to your cart now.